A memorial service for Mary Jane Stahley will be held at 7 p.m. Wednesday Aug. 8, 2018, at The Lawson Center located at 73 Lakeside Dr., Bemus Point, N.Y. Following the brief service an informal reception will begin until 9 p.m. concluding, hopefully, with a sunset like the ones Mary Jane enjoyed throughout the years living on the lake. Mary Jane Stahley of Orchard Grove, formerly of 80 Lakeside Drive, Bemus Point, died Sunday March 11, 2018, in Heritage Park Rehab and Skilled Nursing, surrounded by her children. She was born Jan. 29, 1925, in Jamestown, a daughter of the late O. William and Edna Noble Carlson. She was a 1942 graduate of Bemus Point High School. 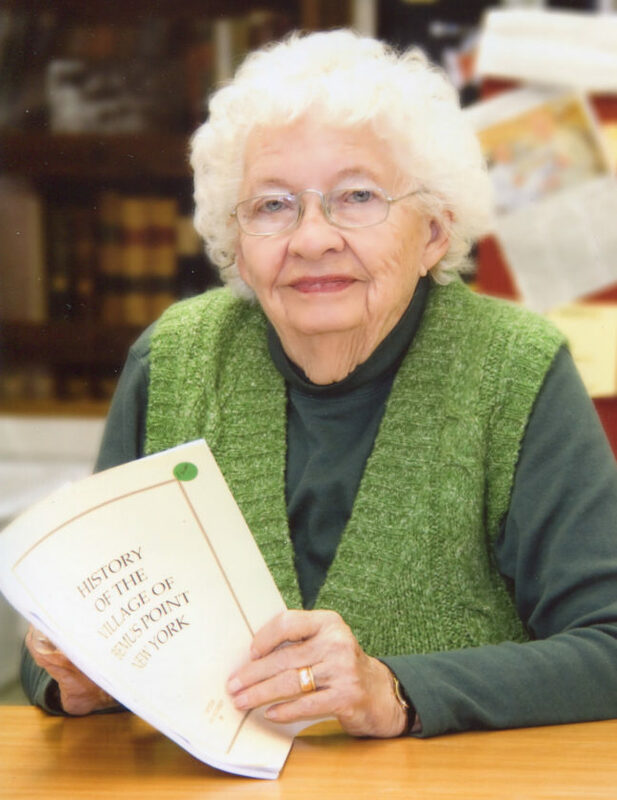 Prior to her retirement at the age of 84, she was employed as a librarian at the Bemus Point Library, where she had worked for over 50 years. She earlier worked as a receptionist for Dr. Banse-Fay and Dr. Boyd. For many years, she served as the Bemus Point historian and wrote the book “The History of the Village of Bemus Point.” In addition, she contributed to several other writings about local history. She loved Bemus Point, history and Jeopardy. All of these interests were fed by being a voracious reader. Above everything she loved her family. She was a member of Bemus Point Study Club, Bemus Point Historical Society, Bemus Point Volunteer Fire Department Auxiliary, Veterans of Foreign Wars 557 Auxiliary and the Chautauqua County Historical Society. Surviving are three children: Jon (Maureen) Stahley of Bemus Point, Barbara Dodge of Greenhurst and Rebecca (David) Kolstee of Jamestown; seven grandsons: Jason (April) Steenburn and Mark (Michelle) Steenburn, both of Jamestown, Joshua (Traci) Stahley of Indianapolis, Ind., Jeremy (Sommer Donovan) Mescall of Greenhurst, Luke (Joeli) Stahley of Clarksville, Tenn., Clark Merrill of Boston, Mass., and Jacob (Kimberly) Stahley of Westfield, N.Y.; and 18 great-grandchildren. She was preceded in death by her husband, Robert Stahley, whom she married May 15, 1948, and who died July 20, 2004; and son-in-law, Charles Dodge, March 23, 2004. Memorials may be made to Mary Jane Stahley Scholarship Fund, c/o Bemus Point Historical Society, PO Box 105, Bemus Point Volunteer Fire Department, 13 Alburtus Avenue or Bemus Point Library, 13 Main St, all of Bemus Point, NY 14712. You may leave words of condolence at www.lindfuneral home.com.